The Paul Dunigan team of Pelham, NH driver Russ Wood, (#29) and Oswego, NY veteran Joe Gosek, (#29) follow Chris Perley in the Vic Miller #11 before the start of the feature. 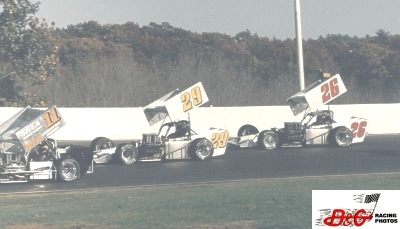 The Steve Miller cars of Randy Ritskes, (#16) and Jimmy Shirey, (#76) line up behind #58 Jamie Letcher and #44 John Gambutti and are followed by #72 Greg Furlong. Here's a site that we all love to see. The starting field for a supermodified race! Do you want some 8x10s? Email your requests here!